On Aug. 26, 1954, the day he turned 17, Joe Sicilia left Chico High School and signed enlistment papers at the local recruiter’s office. The Army was his home for the next 14 years. 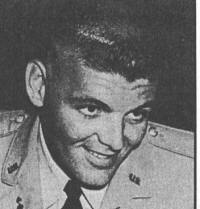 He spent nine of those years as an enlisted man before being commissioned an officer by President Kennedy in 1963. His father recalled that in Sicilia’s days in Chico, he drove beet trucks in the summer and as a hobby raised bees. He also played football for Chico High School. Once in the Army, Sicilia was trained to disarm explosives. That did not constitute all of his distinguished career, however. He served as part of a Secret Service force that accompanied President Lyndon Johnson on a tour of Southeast Asia. He also received a medal for assistance to the Air Force. Sicilia was shipped to Vietnam in February 1968 as an ordnance officer. While there he received two more medals: One for rescuing a Vietnamese child who was headed for a pile of captured enemy ammunition about to be exploded; another for disarming an AWOL South Vietnamese soldier found carrying an armed grenade in a crowded street. Joe Sicilia, 31, left a wife and 18-month-old daughter.